If you need a place to go for a wedding or special event, Alicia is perfect. Its exterior space is massive, there’s a DJ hookup and a bar, and the views are gorgeous. All the bedrooms are ideal for couples, but could accommodate kids as well. To top it off, Alicia has an ideal location near several of Tortola’s beaches and activities. Alicia is a modern oasis above Hodges Creek with unique architecture and a 180º view of the Sir Francis Drake Channel and Virgin Gorda. 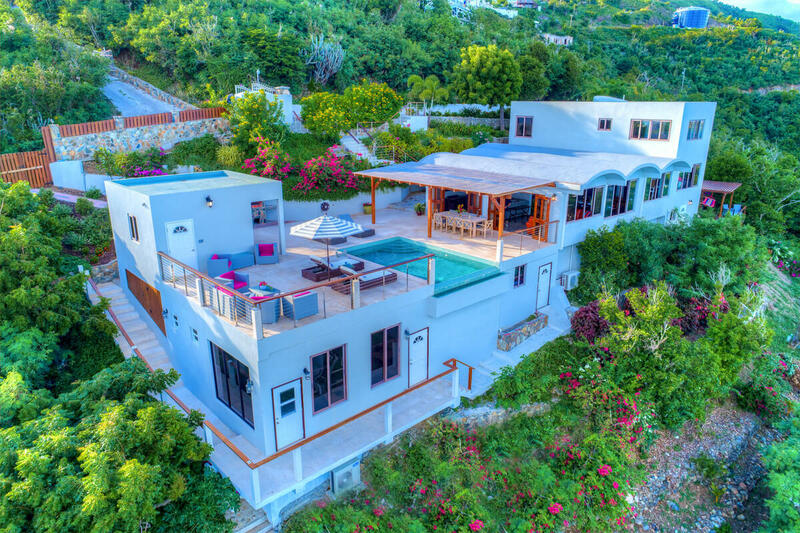 Full air-conditioning and a picturesque setting make this villa ideal for any special event or large group. The pool deck stretches across half of the upper level and faces the ocean. Its infinity pool is bordered by loungers, umbrellas, and hot pink seating. On the opposite side of the deck, there’s a large gazebo with al fresco dining, a pizza oven, and a BBQ grill. The outdoor wet bar and DJ output makes every night a party, and a local stone gazebo at the opposite end of the property provides peace and quiet. Alicia’s air-conditioned gym is state of the art, with a treadmill, stationary bike, weight lifting machine, and a rack. Weddings, parties, and most events can be hosted at Alicia. The barrel-shaped roof and two-story turret maximize the view of the ocean and islands on the horizon. Alicia features modern conveniences like WiFi, satellite TV in the lounge and every bedroom, and a sound system. The villa’s main floor has a full kitchen with granite countertops, a breakfast table, and a formal dining area. The living room has plenty of quiet areas to relax and a full entertainment center with a 60” flatscreen TV. This level also has a laundry room and a turret bedroom. Each bedroom has an ensuite bathroom, ocean views, air-conditioning, and satellite TV. There’s a queen suite on the upper and lower level, and a master suite upstairs. The two turret bedrooms can only be accessed from an exterior staircase, and they both have dressing rooms and queen beds. Alicia is has easy access to Hodge’s Creek Marina, Whelk Point, and several excursion trips. Shops and restaurants are nearby in Parham Town, and there’s several bays around the coast to explore. Bedroom 4: Accessed from an exterior staircase. Bedroom 5: Accessed from an exterior staircase.